OTTAWA -- After successfully hosting two drafts, a Stanley Cup Final and the World Junior Championships in the past five years, the city of Ottawa is going to get a crack at its first All-Star Game in 2012. The Ottawa Senators will celebrate the 20th anniversary of their return to the League by hosting the 2012 NHL All-Star Game at Scotiabank Place, the League and team announced Wednesday. The mid-season showcase weekend will be Jan. 28 and 29. "We know Ottawa can do a terrific job of hosting hockey events," NHL Commissioner Gary Bettman said. "We know this great venue and this city are more than well-equipped to handle this marquee event." Bettman drew prolonged applause from the audience attending the special announcement Wednesday. There was a formidable buzz in the room and throughout the city, which hosted the Stanley Cup Final in 2007 and the NHL Entry Draft in 2005 and 2008, and once again seemed happy to be hosting one the League's signature games. The city hosted the Stanley Cup Final in 2007 and the NHL Entry Draft in 2005 and 2008. Senators owner Eugene Melnyk, team president Cyril Leeder and players Daniel Alfredsson, Sergei Gonchar, Filip Kuba, Chris Phillips and Jason Spezza joined Bettman to make the announcement at the Fairmont Chateau Laurier Hotel. Bettman credited not only what he called a "compelling" bid by Melnyk for Ottawa being awarded the All-Star Game, but he also cited the owner's tireless work since purchasing the franchise in 2003. "Perhaps the most significant and most important reason as to why we're all here today, not just for the All-Star announcement, but for Senators hockey in Ottawa, is Eugene Melnyk," Bettman said. "He has been the stable, firm, guiding force of this franchise since he bought it in 2003. He is a passionate, knowledgeable, involved owner. I believe the NHL is fortunate to have him as one of our owners and we are grateful for all he does." Of course, no one is perfect. "Occasionally he calls me on officiating questions," Bettman joked about Melnyk, "but we're even grateful for that." With the All-Star Weekend about 500 days away, there's still no specifics about activities that will take place around the event. Alfredsson said he would like to see Ottawa's Rideau Canal, which becomes the world's largest skating rink when it freezes over in the winter, involved in some way. There was even speculation at one time that the Senators were considering playing an outdoor game on the surface, although that has yet to happen. Melnyk wants the weekend to be a message to fans that the organization is doing everything it can to continue bringing Ottawa major hockey events. "It's just another layer of activity that shows our fans how much we care for them, that we go the extra mile, that we go the extra step in appreciation to bring such world class events in hockey," Melnyk said. "What we're trying to do, and I think we're doing that successfully, is just continuing that message. And it's not just talk. We get things done. I go back to the 2009 junior championships and what that did for this city on a global scale, it was just phenomenal. I think this upcoming All-Star Weekend is just another stepping stone in building that solid foundation for the Senators going forward as a successful franchise. "The Ottawa Senators and our hockey fans couldn't be more excited at the opportunity to host and showcase the NHL's top players in 2012. We will create a once-in-a-lifetime, weekend long celebration of all that is great about hockey, the NHL and our city." "The fact is it all starts with the fans, and the Ottawa Senators fans bring their passion to Scotiabank Place every game," Bettman said. "They're involved, they're excited, and we're thrilled to share this event with them." After some early struggles when the franchise returned in 1992, the Senators have been one of the League's consistent winners in recent years, having made the playoffs in 12 of the past 13 seasons. The Senators have averaged close to 19,000 fans a night since 2005-06, and there's a good chance they'll have a hometown player to cheer in 2012. 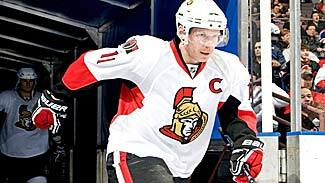 Alfredsson is a five-time All-Star who will be 39 years old by the time the All-Star Game comes to Ottawa. Taken in the sixth round of the 1994 Entry Draft by the Senators, Alfredsson is under contract through the 2012-13 season. "I'd love to be part of it, said Alfredsson, who Bettman described as one of the League's great ambassadors on and off the ice. "I'm sure I'll be part of it even if I'm not playing in the game." Gonchar, who signed a three-year contract with the Senators this summer, is also a five-time All-Star. 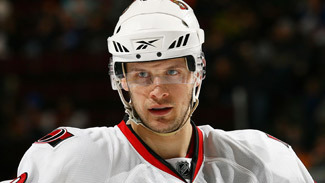 Spezza has appeared in one All-Star Game, while Phillips and Kuba have yet to receive the honor. Additional details on the 2012 NHL All-Star Celebration, including information on tickets, special events and television broadcasting will be released at a later date. The Carolina Hurricanes and the city of Raleigh will host the 2011 National Hockey League All-Star Celebration, including the Honda NHL SuperSkills® competition and the 58th NHL All-Star Game Saturday, January 29 and Sunday, January 30.